Students discussing summer internships in the Business Placement Center. Summer internships are important for students of any level in college, as they give students an opportunity to gain real world experience and to apply what they have learned in the classroom. To that end, the Business Placement Center has a variety of resources available for students, including Connect2Careers, career counseling, business career tools, and much more. 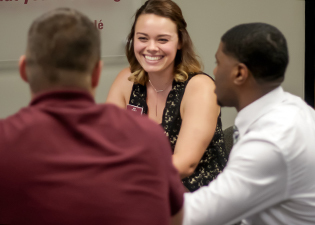 Connect2Careers is a system that allows current students and alumni access to internships, full-time positions, interview schedules, employer presentations and other events. Students need to build their profile and upload their résumés so employers can view their information. This system also allows students to search for jobs and internships, as well as certain employers. Danna Lewis, director of the Business Placement Center, explained the importance of a College of Business student to have a summer internship. For more information visit the Business Placement Center in Rehn Hall or the website at placement.business.siu.edu/.